Pursuing healthful foods that kids will eat, local districts are taking the obesity battle to the next level. Gone are the days of American chop suey from a can and unidentifiable slabs of meat covered in gloppy gravy. School lunch is going back to its roots, sourcing fresh ingredients from Maine farms and cooking mom-worthy hot meals from scratch in an effort to combat childhood obesity by providing healthier, less processed food. 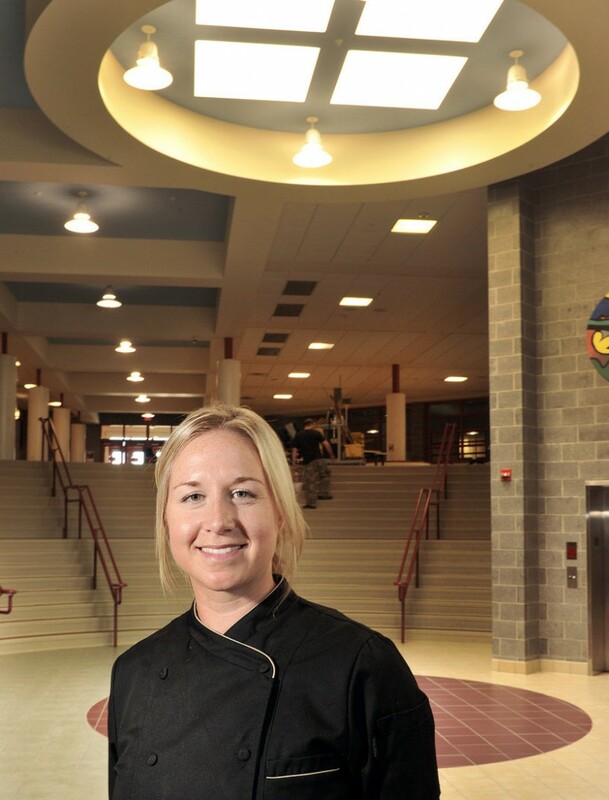 This year, the Windham-Raymond school district is going a step beyond buying grass-fed beef from a farmer up north or apples from the orchard down the road: It’s added a full-time chef to its school nutrition department. Samantha Cowens-Gasbarro, a culinary school graduate who spent the last eight years working as a personal chef and teaching cooking classes in Boston, will train the cooking staff at six schools, teach after-school cooking classes, shape the school lunch menu to the students’ tastes, and generally find ways to get children more invested in the food they put in their bodies. Southern Maine schools have been focusing on meeting the new federal school lunch guidelines, which went into effect in the 2012-13 school year, for a few years now. This year, they are mostly building on those efforts to feed kids more whole grains and vegetables, cut back on sodium, and bring in more local foods. While not all of them are hiring full-time chefs, some of them bring in chef consultants and restaurant chefs regularly to train staff and work with students. Every Thursday, the school lunch menu will feature Maine ingredients such as redfish bought direct from the community-supported fishery Salt and Sea, breads from Amato’s Bakery, beef from Maine Grind in Guilford, and fruits and vegetables from Spear Farm in Waldoboro and distributors Crown of Maine in Presque Isle and Farm Fresh Connection in Freeport. The Portland district is the state’s largest, and currently spends 12 percent of its food dollars on local products. The goal is to increase that figure to 30 percent, partly through programs like Buy Local Thursdays. One big example of that is Adams’ “Maine Marinara,” a red sauce he started working on about four years ago that contains lots of “hidden” vegetables that boost its nutritional quotient: garlic scapes, onions, zucchini, summer squash and golden beets. First, hundreds of pounds of these vegetables are sauteed and caramelized in a big kettle, then Adams adds 700 pounds of tomatoes for a single batch. The sauce cooks down, then it’s pureed with an immersion blender. The school system already buys farm shares and surplus produce from Little Ridge Farm in Lisbon Falls, apples from Sweetser’s in Cumberland, and corn from Spear Farm in Waldoboro and R. Belanger & Sons Farms in Lewiston. And, like many Maine schools, it already has its own school gardens that provide it with foods such as blueberries, raspberries, asparagus, garlic and Swiss chard. Just last week, Poliquin picked fresh peaches from the high school’s orchard. Poliquin hopes to recruit parent volunteers this year at the elementary school to do a once-a-month taste test of a new vegetable preparation or entr?item. She’s considering, for example, buying some kale from a northern Maine farmer who has an abundance of it this year. “Can we do something to make beets more exciting?” she wondered. School districts that are part of the York-Cumberland County School Nutrition Purchasing Co-op have joined together to apply for a $100,000 USDA grant that focuses on local foods. The Sacopee Valley school district is the lead applicant, but the effort also includes Scarborough, Cape Elizabeth and a handful of other districts. Peter Esposito, director of food services for Cape Elizabeth schools, said if the schools win the grant, he already knows what he’ll use the money for — a greenhouse. Esposito said he would also like to get the schools’ monthly guest chef series going again, featuring chefs from local restaurants. Before starting her new job at the Windham-Raymond school district, Cowens-Gasbarro attended a “Chefs Move to Schools” training program in Oxford, Miss., organized by the National Food Service Management Institute. Chefs Move to Schools is part of first lady Michelle Obama’s “Let’s Move!” initiative to fight childhood obesity. The training familiarizes chefs with the new federal school nutrition guidelines and shows them how they can be most helpful to their partner school. She’s going to get student feedback on school menus so she can develop dishes that cater to their tastes but are also nutritious. And there may be some recipe contests, with the winners getting the chance to see their dish served to their friends in the cafeteria. Cowens-Gasbarro said one of her goals will be to start cooking classes or an after-school cooking club for students “to really get their hands dirty.” She noted that a lot of children are interested in cooking because of the cooking shows and celebrity chefs they see on television, but they don’t really know their way around a kitchen. The decline of home economics classes and the lack of cooking by parents at home has left a huge knowledge gap.